I enjoy custom orders. They give me a chance to do something different, to experiment, to learn something new, or simply to explore new techniques. 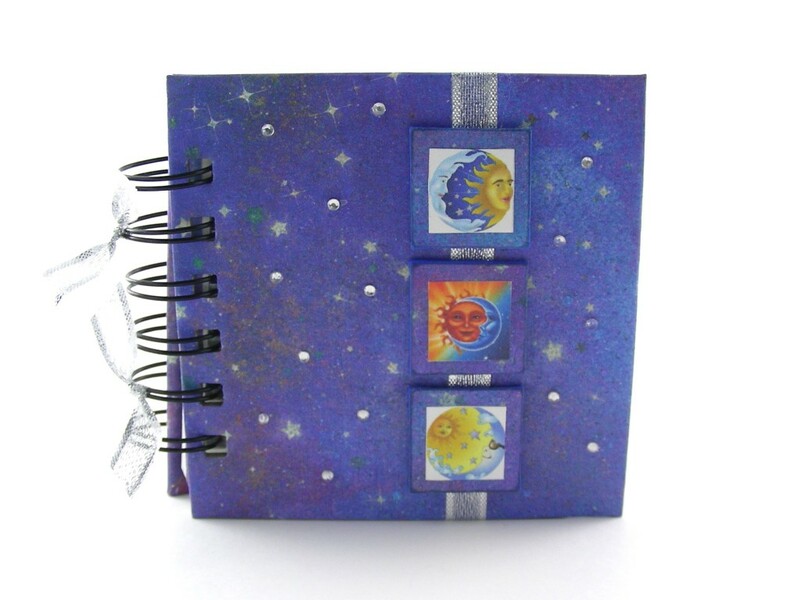 Recently a buyer-and-friend asked me to design a “celestial” gratitude journal for her—basically, a book with a cover featuring the sun, moon and stars. 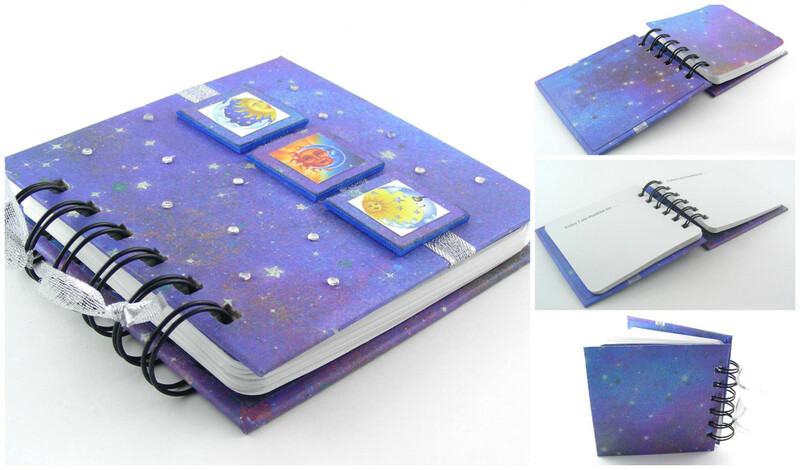 Because so many of my handmade books feature flowers or a floral theme on the cover, a celestial-style journal represented a welcome departure from the norm. This post is about what happens behind-the-scenes after you click on the “Request Custom Order” button of my Etsy shop, MisterPenQuin. The Request Custom Order button opens up a private conversation (convo) between you and your seller, initiated by you, that enables you to inform the seller about your preferences, and allows the seller to describe, both in words and pictures, how your wishes can (or can’t) be granted. I don’t know exactly how many messages are typical for a custom order convo stream, but I would guess it’s a half a dozen or more. For this order, 12 messages were exchanged, but I’ve done custom orders that involved as few as five messages or as many as 19. In any event, communicating clearly with my buyer before I click on the “Make this a Custom Order” button is a great way for me to “get things right.” I nearly always attach a PDF document with thumbnail photos to one of the messages within a convo stream. This helps my buyer narrow down choices and for me to ask questions that enable me to fill the order. Because I didn’t already have celestial-style paper in my inventory, I made a trip to my local scrapbooking store, and discovered it only had paper with plain stars on a solid background, and Halloween-style paper that looked a bit garish for the purposes of this journal. The next best option was digital paper from an Etsy seller—something I can also re-use for other books. I researched a few options and shared them with my buyer, presenting a few ideas about how they could be combined with other options. 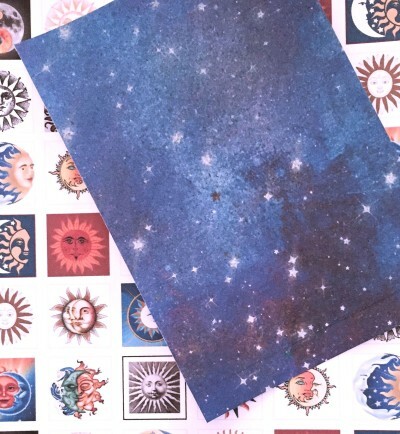 In the end, the choices were narrowed down to one of the papers in the Galaxy Night Sky collection from FishScraps, and three celestial images from Sun and Moon Digital Collage Sheet, designed by Graphics Digital. If you use digital papers in a project you sell, by the way, make sure you check the seller’s policies. Some allow you to make and sell projects with their images, while others only allow for personal use. If in doubt, don’t make assumptions; check with the seller. The blue of the Galaxy Night Sky paper keeps changing in this post, as I took photos at different times of the day. The final photos are pretty close to the correct shade, as they were taken within a light box. The first thing I had to figure out, once I began working on the order, was how to incorporate the celestial images. 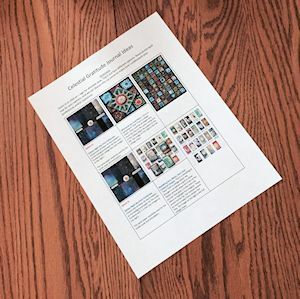 I had proposed making dimensional tiles with them, but the collage images were designed as one-inch tiles—a quarter-inch too large for a 4-inch by 4-inch journal after they are matted. I adjusted the settings within my printer’s dialog window, and “tricked” the printer into treating my paper as only six inches wide. This caused the collage images to print out as three-quarter-inch-wide tiles. Perfect! 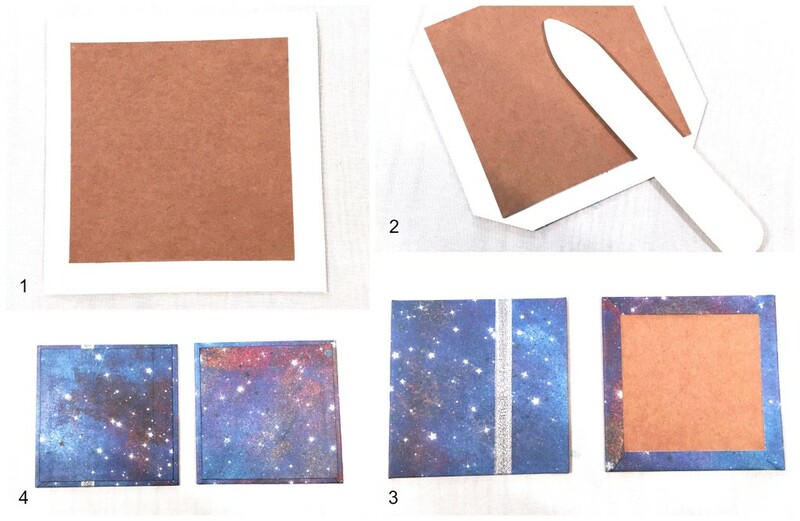 I matted them against one-inch squares of Galaxy Night Sky paper by running the celestial image squares through my Xyron® Create-a-Sticker™ (figure 1), then inked the edges with Tim Holtz Distress Ink in Stormy Sky (figure 2). I subsequently adhered the squares to craft foam to create dimensional tiles (figure 3). The last step was applying a sealant called Tim Holtz Distress Micro Glaze that makes the paper water-resistant (figure 4). I set the tiles aside and began working on the cover. I always begin by cutting the chipboard and papers to size. Then I adhered the paper to the chipboard and let it dry for a minute or so (figure 1). 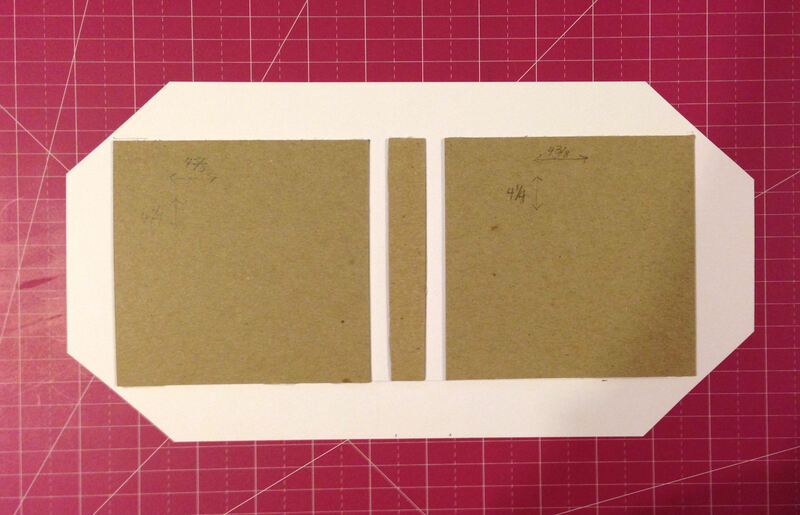 I sliced the corners off the paper for mitering purposes and scored around the edge of the chipboard (figure 2) with a bone folder (figure 2). 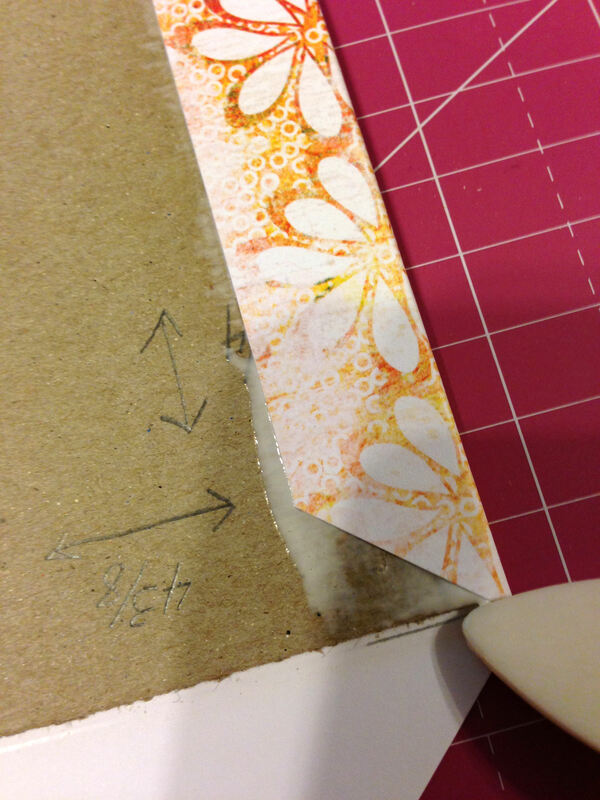 This helps “train” the paper to fold more neatly around the edge of the chipboard when you adhere it to the chipboard (figure 3). I also applied silver ribbon down the front cover at this point, wrapping it to the inside cover. 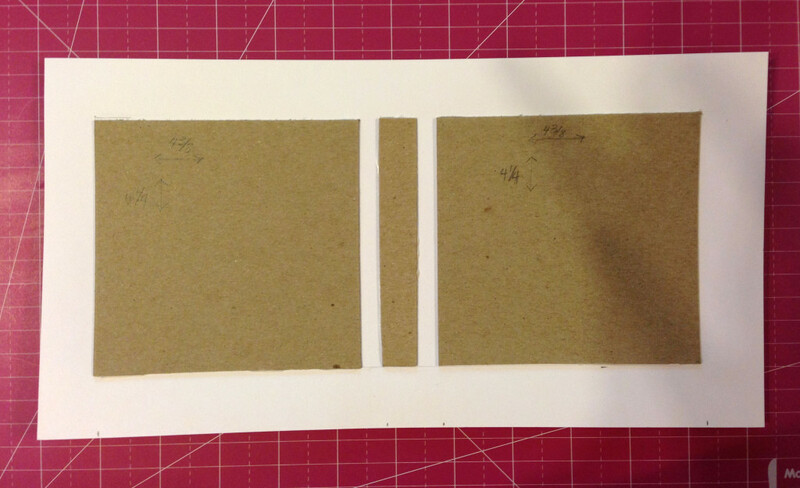 The last step involved adhering squares of paper to the inside front and back covers (figure 4). While I worked on the inside pages, I tucked the covers between two sheets of wax paper inside a book press. Without this step, the covers have a tendency to warp. I typically leave the book covers in the book press for at least a few hours, or overnight. The inside pages were printed with my laser printer, four pages to a letter-sized sheet of paper. These were trimmed to size with my RotaTrim paper cutter (figure 1), after which I rounded off their corners with a Crop-A-Dile Corner Chomper (figure 2). Did you know that rounded corners tend to tear less than right-angle corners? That’s one reason for this extra step, but I also think it looks nice. 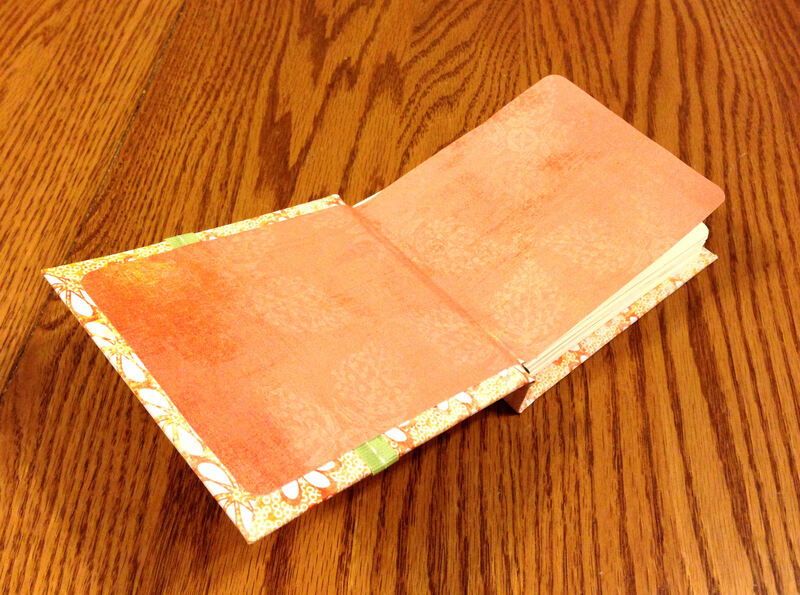 The pages were pre-punched for spiral binding, for which I used my Cinch (figure 3). You can follow the directions on the platform of the Cinch to punch your papers, but I always use a paper jig for positioning because I think it’s faster and easier. This is simply a piece of cardstock that is the same size as the page, pre-punched with the appropriate number of holes and marked with a center line that aligns with the centering arrow on the Cinch. You can see the completed stack of punched pages in figure 4. After I removed the covers from the book press, I applied micro glaze to them (first image). This is especially important for inkjet-printed papers, as you never know how colorfast the ink is. The protectant does not waterproof the paper, but it does make it water-resistant. I punched holes in the cover to match the holes in the pages (second image), and finally assembled the entire book, fastening everything together with an owire (third image). The last stage of book design is always my favorite: embellishing the cover. As you can see below, I adhered the foam-backed tiles to the ribbon. 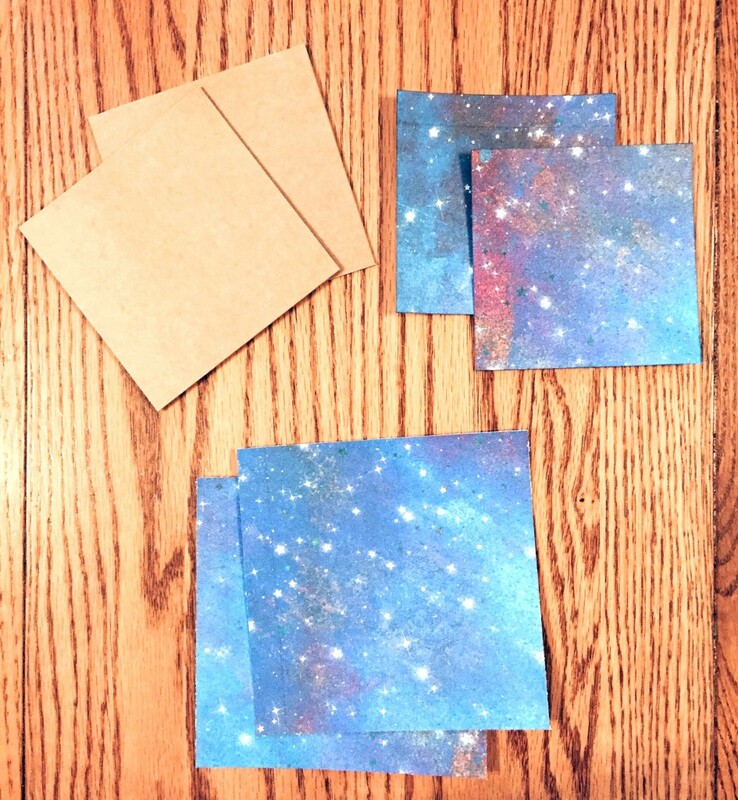 Then, because I knew my buyer/friend likes a little bling, I adhered some tiny crystals to the Galaxy Night Sky paper, which give the appearance of twinkling stars. I reinforced the sticky-back adhesive on the crystals with Ranger Multi Medium Matte to make sure they won’t come off easily during the life of the journal. Finally, I tied some silver ribbon “bows” to the owire, something I do with nearly all of my journals. When the book was done, I took photos for this post and for my own records. To be fair, most of the stages of development for this celestial-style journal are involved in my entire bookmaking process, except for the series of messages that initiated this particular order. But if you’ve ever wondered what goes on behind the scenes of one of my books, from “conception” to “giving birth”—especially if you have a custom request—now you know how things work. I really enjoyed customizing this gratitude journal for my buyer. I have a number of cutting mats that I use for both paper crafting and sewing and didn’t think I needed another, but I was wrong. 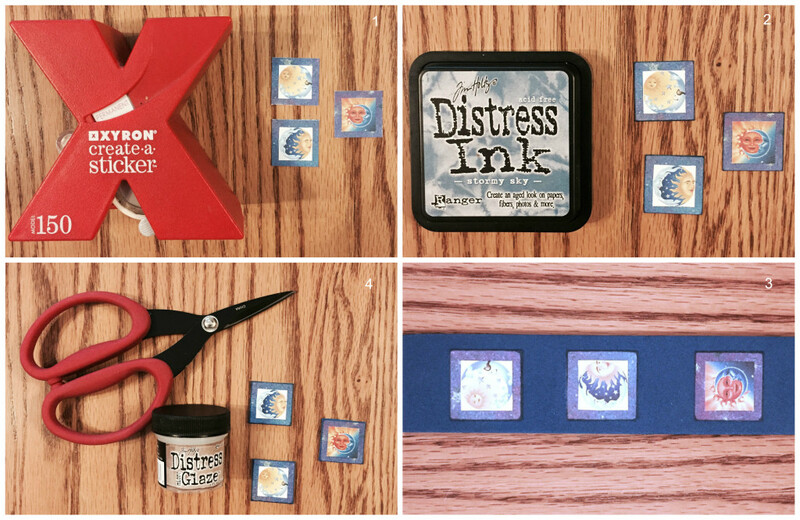 A few weeks ago I spotted a magnetic, self-healing cutting mat at my local scrapbooking shop, and got pretty excited about it. I didn’t absolutely need it, but I’m a Tool Girl, so I’m afraid it had my name on it and I took it home. 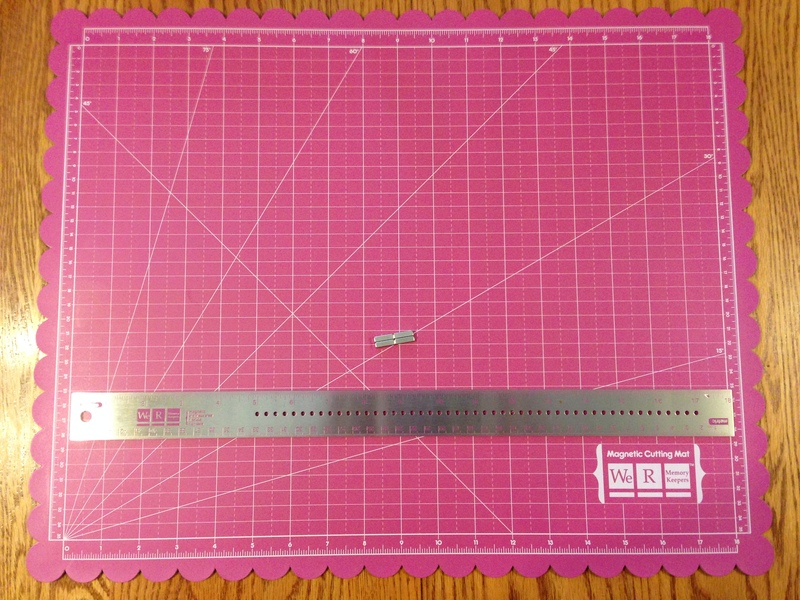 My initial thought was that this generously sized 16-inch x 20-inch cutting mat that comes with a magnetic ruler and four magnetic posts would be great for paper crafting, but it’s perfect for sewing, too, with all of the built-in grid and bias lines. And if you’re cutting fabric with a rotary cutter, having a magnetic ruler and magnets to keep the fabric in place makes it really easy to do a clean cut. The mat is double-sided, which means that it has an extra-long life. The folks at We R Memory Keepers tell you that you can use the holes in the ruler for marking or as a stencil, and they point out that you can trace the scalloped edge of the cutting mat for scallop-edge projects. For my first project using the cutting mat, however, I intended to take advantage of the fact that the printed rulers on the edges of the mat allow you to measure in very small units. 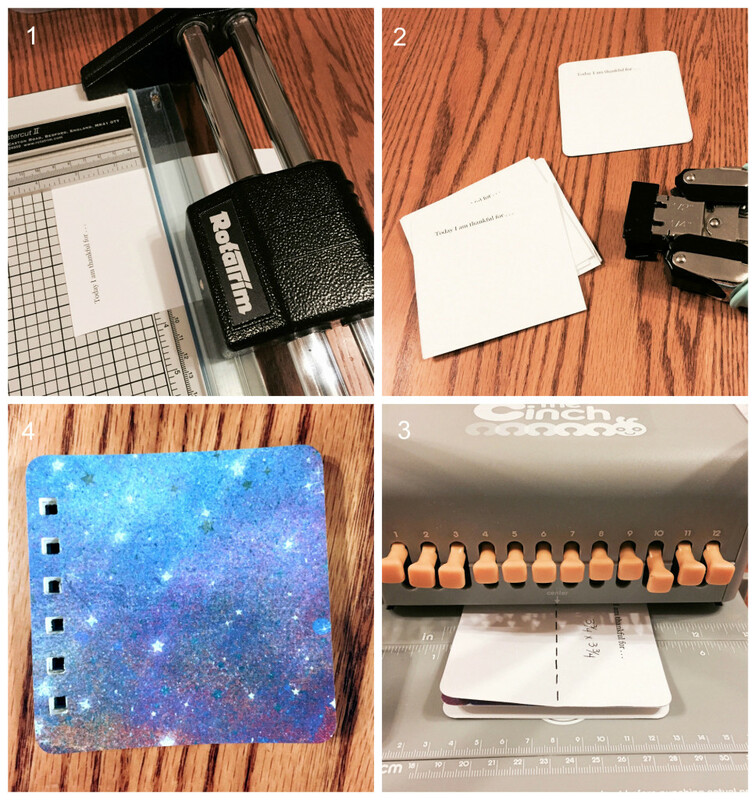 This is very handy when you’re lining up chipboard or book board pieces for a case bound book cover. If you look closely at the above image, you’ll notice that the two short sides are in centimeters, and the long ones are in inches, with lots of marks for smaller units. I thought the ruler would be handy, too, to mark the baseline of the chipboard pieces and keep them from shifting. Once you have cut your boards to the appropriate dimensions, you’ll need to cut a piece of card stock or book cloth that leaves you with about an inch-wide border, all around. You can make your own book cloth if you like by adhering paper tissue to the back side of it with Heat N Bond® Ultra Hold, or you can simply iron on interfacing. Whether you use card stock or book cloth to cover your boards, you’ll be gluing the boards to the back side using PVA glue. I don’t mention it in my instructions, but I’m a fanatic about using my book press while glue is drying. I recommend you do the same (or use a heavy stack of books) because this will help prevent warping of both your cover boards and your pages. Use wax paper where necessary to prevent glue from seeping into areas it does not belong. Your next step is to trim the corners of the book cover. Slice off diagonally the corners of the paper or book cloth, leaving a 1/8 inch margin where the two sides of each corner meet. 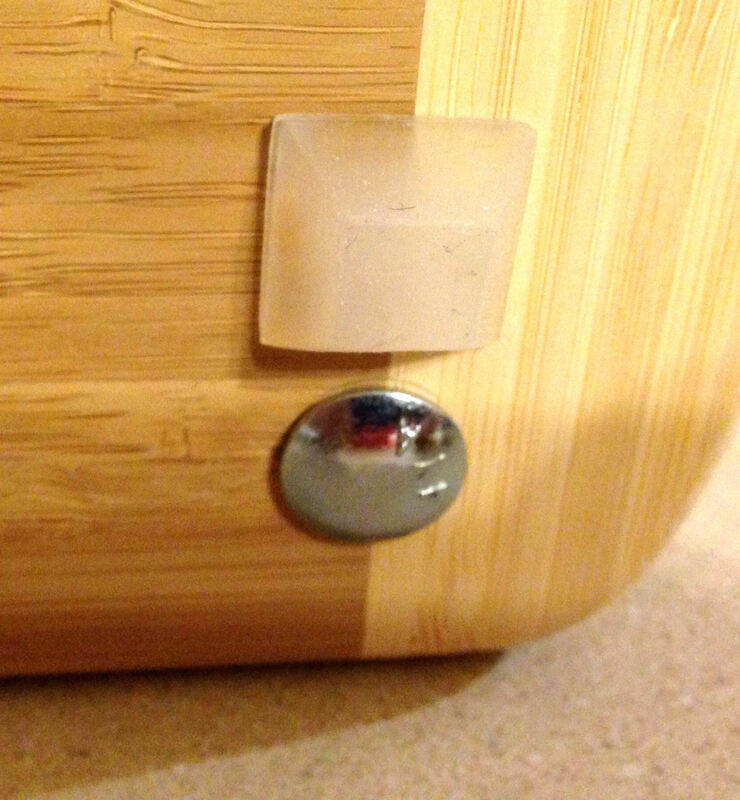 This is important because it will prevent the boards from showing in the corner when you glue everything down. The image below doesn’t show it, but if you’re using paper, as I am, I recommend taking the tip of your bone folder, and scoring around the outer edges of the boards. This makes it easier to wrap paper around the boards. Using a foam brush, apply PVA glue to one side of the paper or book cloth, beginning in the center and working out to the corners. Make sure you brush the edge of the board, too. Then, bend the cover toward the glued surface (not the other way around) because this will enable you to have a tighter, neater “wrap.” You can think of it as training the paper or book cloth to fold in the direction you desire. 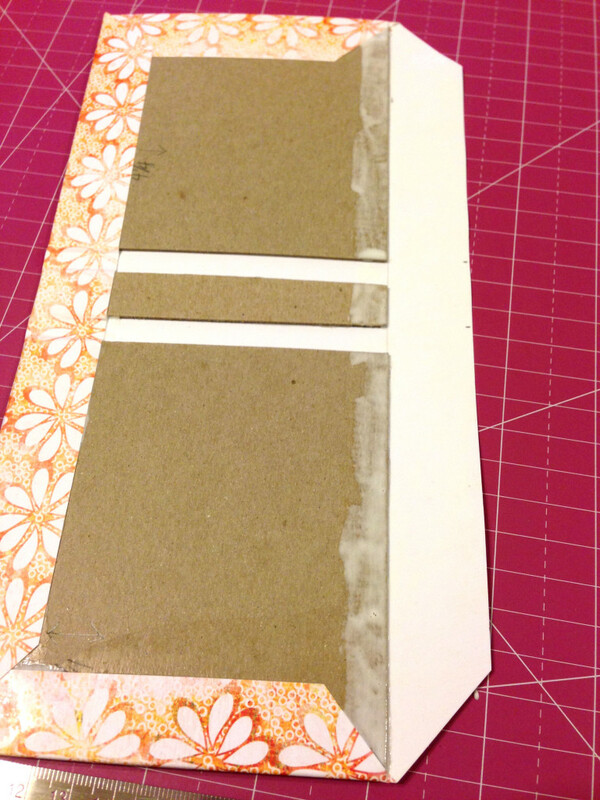 Go ahead at this point and do the opposite: fold the paper or book cloth toward the chipboard. Use a bone folder to smooth out bubbles. Remember that 1/8 inch margin of paper or book cloth that you are supposed to leave in each corner? Use the tip of your bone folder to press it down, snugged against the edge of the board. You’ll repeat this in each corner as you glue down each side of the cover. Apply extra glue if necessary. Using the procedure described in the previous paragraph, work on the opposite side of the cover. Then work on the third and fourth sides. Remember to use your bone folder to flatten the extra paper or book cloth in the corners, flush against the board. When you have wrapped the paper or book cloth around your boards, this is what it will look like from the inside and outside. I used my bone folder to gently smooth the paper into the gap on either side of the spine. 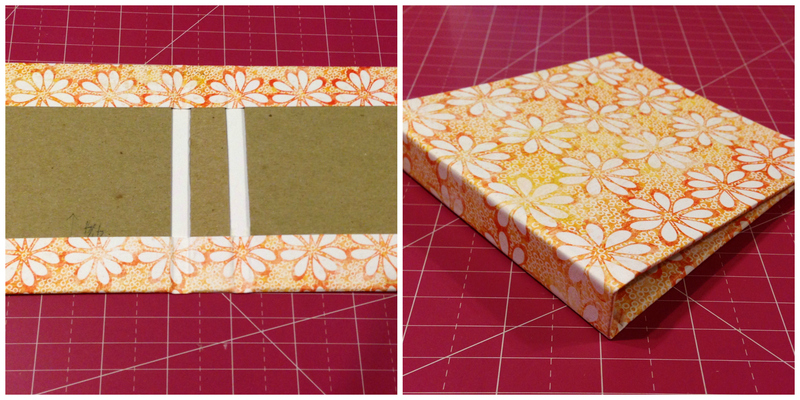 I decided to embellish my cover with a ribbon, wrapping the raw ends to the inside of the book and gluing them down. When your cover is finished, you need to insert your text block. Brush PVA glue onto the back side of the end papers, and glue them down to the inside of the covers, leaving about a 1/8 inch border on each side. Do not glue down the spine or brush glue into the gap on either side of the spine; the end papers will anchor the text block quite nicely into place. I made a mistake and got glue into the gap. The result was that I stressed my end papers in this area, causing a small tear. My husband told me that he didn’t even notice it and that I shouldn’t worry, but all I could think about was the possibility that the small tear would become a bigger tear. I also noticed that the ribbon created a ridge in the end paper. I’m not sure how to solve that issue at this point, but in the future I may consider (a) using thinner ribbon, (b) scoring the board in such a way that the ribbon sinks into the “depression,” or (c) adding another layer to the end paper to hide the ridge. We’ll see! Meanwhile, that tiny tear continued to bother me. I decided that if I couldn’t fix it, I would reinforce the area. But I didn’t want it to look like a reinforcement! 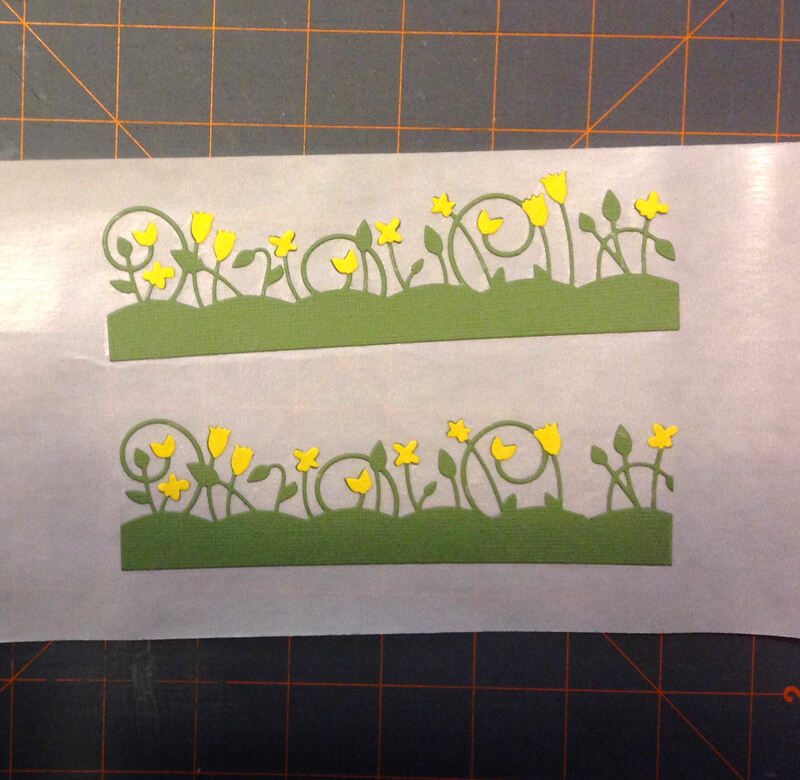 Instead, I used one of my steel craft dies to cut out a floral border in two colors, green and yellow. 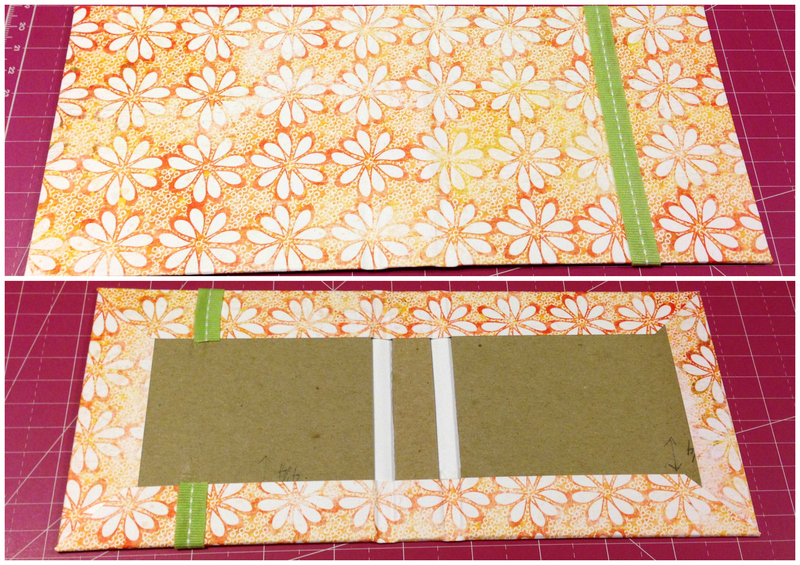 I cut and layered the pieces, and ran the border strips through my Xyron® Create-a-Sticker so that it would be easy to glue down the rather fragile border. If you have an adhesive eraser, this is also handy for removing the excess adhesive that inevitably gets stuck between all the small pieces. Last step was adding a flower to the front cover of my book. If you’ve ever visited my Etsy shop, Mister PenQuin, you know that I usually add a floral embellishment to my books. This is my first case bound experiment with a sewn text block—definitely not perfect, but I learned a lot from this experiment. When I first began making books, I used stacks of books and magazines to press covers flat after adhering paper to chipboard. This definitely worked, but I’m afraid it left my kitchen table in disarray much of the time. “You really need a book press,” my husband said. “I’ll make you one.” As it happens, I had just begun subscribing to the Sea Lemon channel on YouTube, where Jennifer Bates has a how-to series on making books. Jennifer uses a book press she made herself from a couple of cutting boards. Great idea, I thought. That design would work for me. 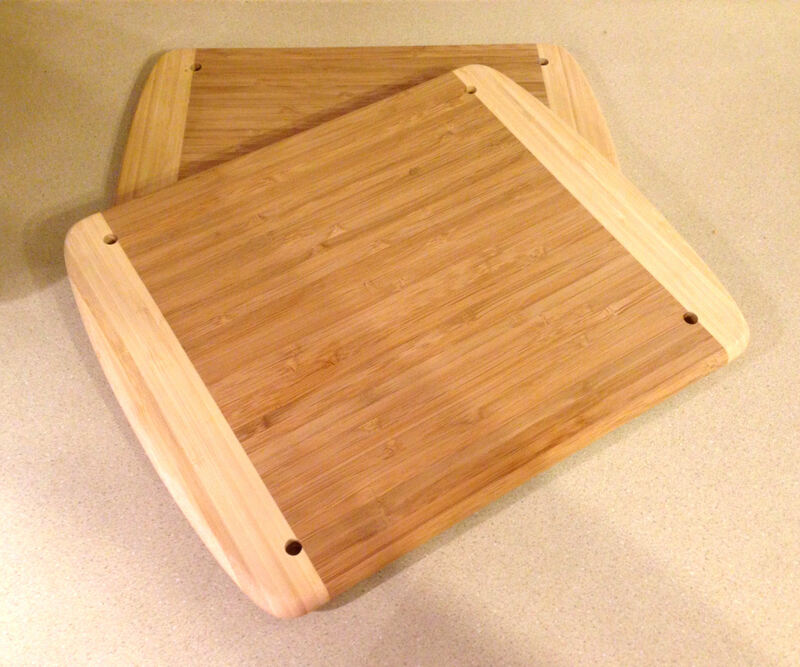 Jennifer’s book press calls for two cutting boards you can pick up in the kitchen department of most big box stores such as Target or Wal-Mart. John found two bamboo ones at Target for about $10 apiece. That represented the majority of the cost. Jennifer’s version of the book press calls for two holes to be drilled in each of the boards, centered on the short sides. John thought, however, that the book press would distribute weight more evenly if there were four holes for the bolts, one in each corner. 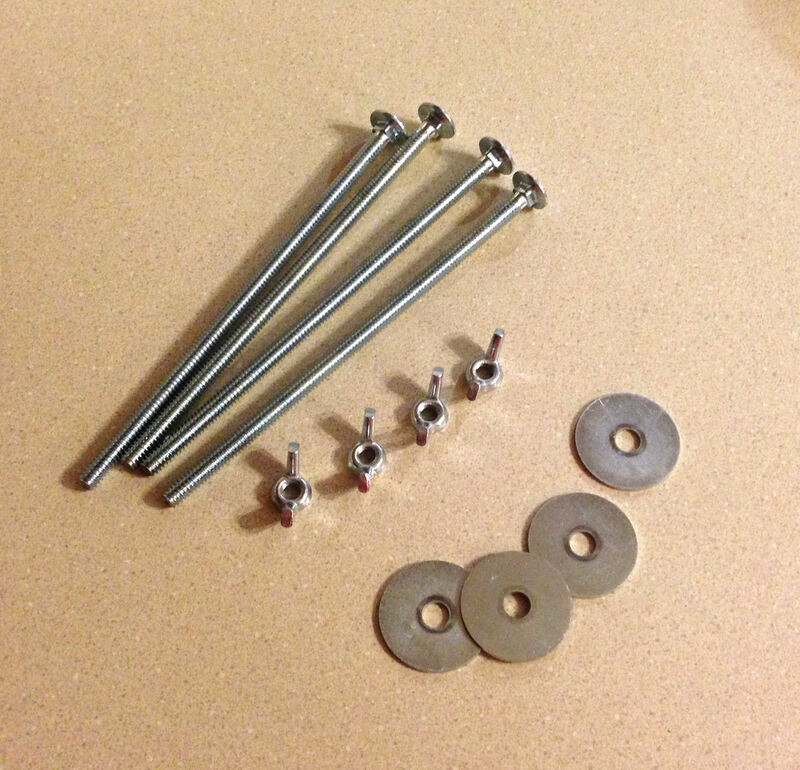 He purchased four quarter-inch diameter bolts, five inches in length, along with four matching wing nuts. He also bought four washers to place beneath the wing nuts, to prevent them from gouging the wood. I doubt he spent more than $3 on hardware. 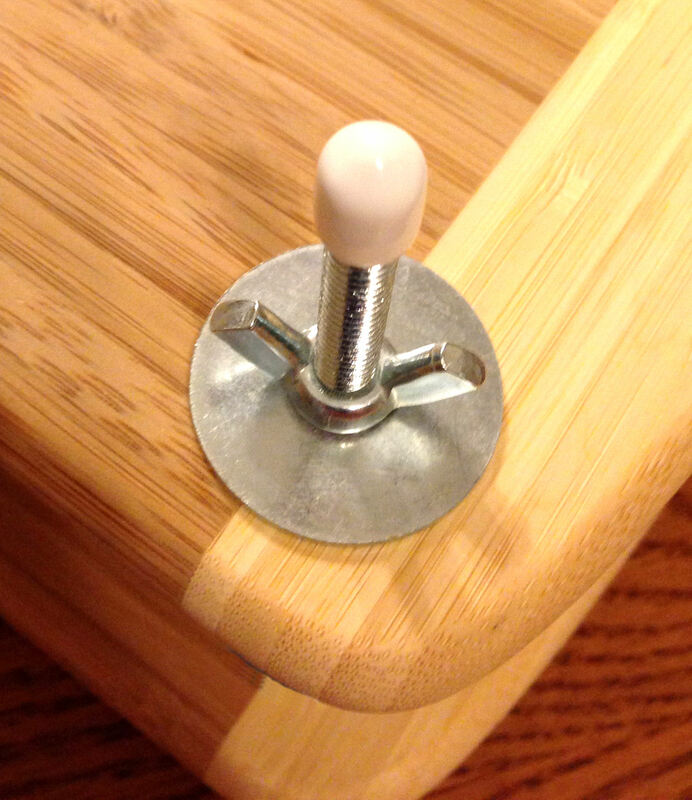 If you don’t protect your work surface, the bolts can scratch the surface on which your book press sits. An easy solution is to adhere rubber feet to the bottom. I pointed out to John that I was afraid I would I scratch myself on the ends of the bolts, so he added vinyl end caps to the bolts. He had a quite a few of these left over from some unused wire shelving, but you can purchase a bag of these at an economical price from any home improvement center. The added benefit is that if I stand the book press on its side to apply glue to the spine of a book, the bolts act as a stand, and the capped ends can’t scratch my table top. When the book press was assembled, it worked very well, with one exception. We noticed that the bolt threads were creating resistance as I slid the upper board up and down. John solved that issue by drilling slightly larger holes in the upper board. In the version sold by Jim Poelstra of Affordable Binding Equipment, we observed that his version of a similar book press includes compression springs that hold up the top board. He also added copper bushings to the insides of the holes in the wood to prevent resistance. 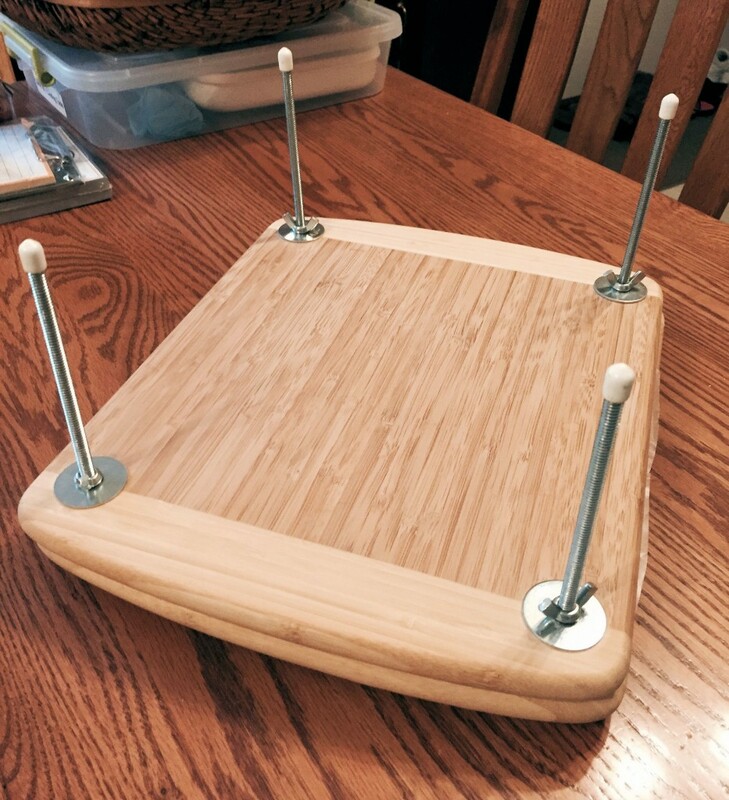 John does not have the kind of tools that will allow him to do the equivalent, so if I really need to raise my upper board while sliding in a book, I simply have to lift the board manually with one hand while sliding in the book with the other hand. It’s not a big deal. The fact that my book press cost under $25 to make versus Jim’s admittedly much more professional one that costs $60 doesn’t displease me. I pointed out previously that when you adhere rubber feet to the bottom board, you’ll avoid scratching your table top. However, I noticed that if you’re carrying around an empty book press without the wing nuts being screwed all the way down, the bolts drop down through the holes. The Safety Girl inside me immediately considered how easy it would be to gouge yourself, a piece of furniture or a wall (assuming you can’t want walk a straight line for whatever reason). The DIY solution is humorous, however. 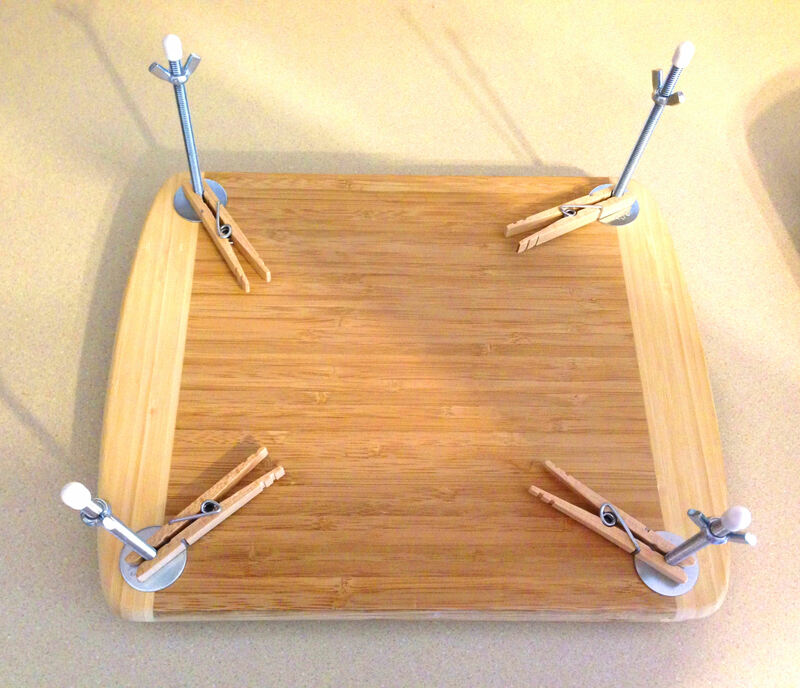 I grabbed some clothespins from the laundry room to anchor the bolts in place. Secondarily, they act as a third hand to raise the upper board if you’re pressing a thick stack of books or a single thick book. Just slip them beneath the upper board, and they support it (temporarily) quite nicely. Yesterday I visited the Affordable Binding Equipment Web page again, where I drooled over the images showing a lying book press, a punching cradle, paper making press, and other impressive pieces of bookbinding equipment. 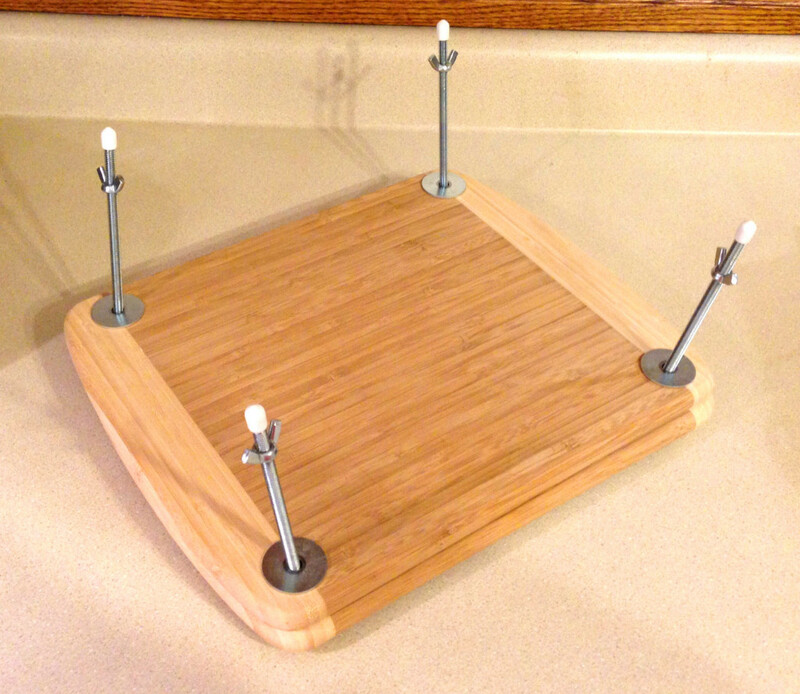 The owner of the business is a journeyman cabinetmaker who sells these items using scraps from his cabinetry business, so his prices are more affordable than if you were to shop from a company that specializes in making only bookbinding equipment. However, that doesn’t mean his equipment is in any way inferior. I have a feeling I’m going to take the dollars I saved from having John make me a book press and apply them toward the purchase of a bookbinding plough and and lying press. The plough trims text blocks, and the lying press holds the pages steady as you cut. “I have neither the tools nor the experience to make those items,” John said. Not that knowing the correct terms makes any difference when it comes to bookbinding, but I learned from Jim’s Web page that the boards of a book press are called platens, and the space between them is called daylight. Bet that makes you feel just as knowledgeable as I do—ha! Seriously, though, it’s not too difficult to make a no-frills book press, if you have a drill, a few washers, wing nuts, bolts and a couple pieces of wood. 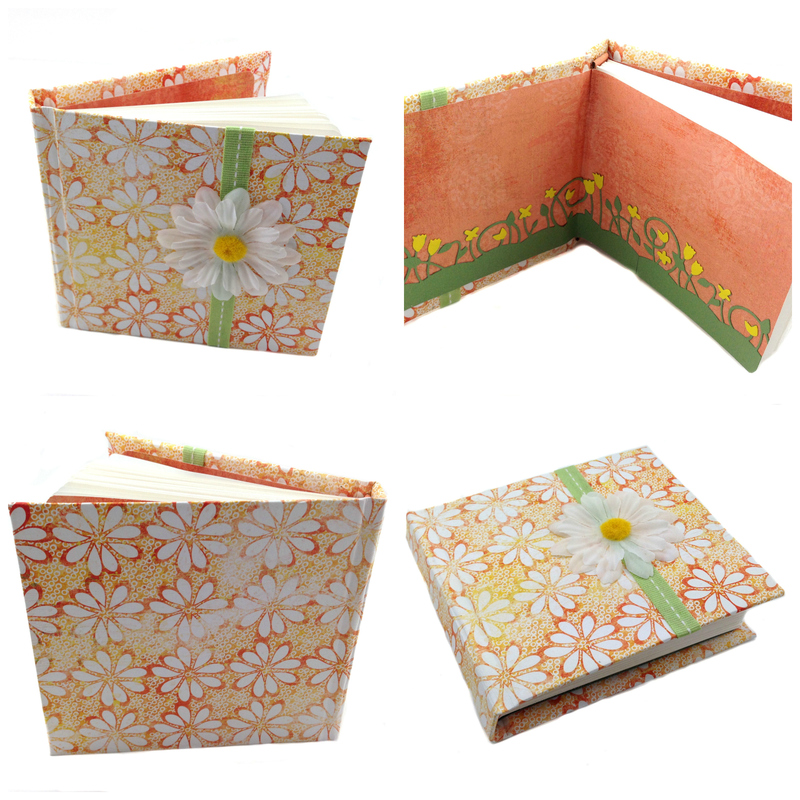 Even if you don’t bind books, the press is great for flower pressing. Have you made some tools for yourself that would have cost much more if you had purchased them? Describe them in the comments below.